Next thing we need to do is make the door a block. We need to do this so we can edit the door in the block editor. 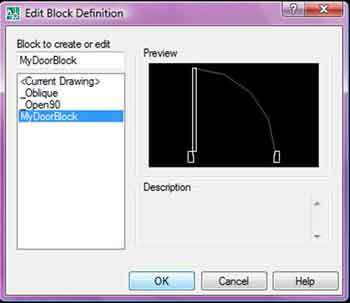 The block editor is where we make this basic door block into a dynamic block. To make the block, select all the objects that make up the door and type 'B' (for block). The block window opens (Fig.2). Name the block 'MyDoorBlock' (Fig.2), and Click OK.
Now the door is a block, so we can now edit it in the Block Editor. A window will appear (Fig.4) with a list of Blocks to choose from. Select the block we just created called MyDoorBlock (or whatever you named it) and Click OK . We are now in the block editor. When you are in the Block Editor, there are new tools available to you. These tools can only be accessed whilst in the Block Editor. 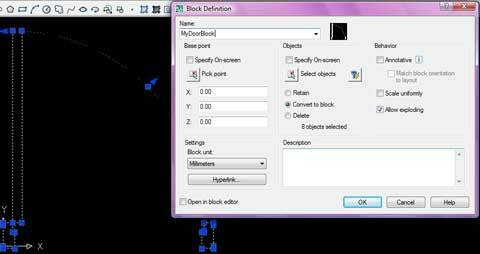 On the left hand side of the screen is the Block Editor toolbar pallette. 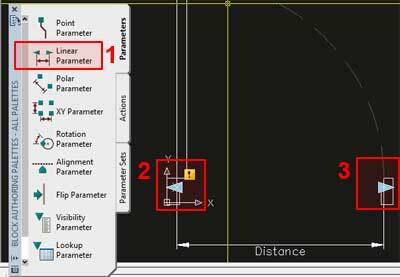 First thing we are going to do is click the 'Linear Parameter' and add it to our door. We now have our first parameter added to the block. 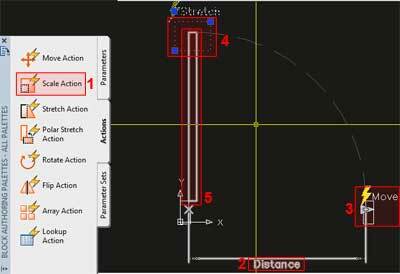 This parameter tells the block to do something when the Arrow Grip (Cyan coloured Arrow) is dragged in a linear motion. To understand how this works, we have selected a parameter (linear) which will control how an action (yet to be selected) will work. The action is connected to the line's that make up the door. Don't be concerned if this doesn't fully make sense, it will as you continue through the tutorial. The linear paramater has 2 Arrow Grips. We only want 1 Arrow Grip so the door will have a fixed point at Arrow Grip 1, and be stretched by selecting and moving Arrow Grip 2. To do this, select the linear parameter by clicking on the word "Distance" (1 - Fig.7), then right click. A menu will pop-up. 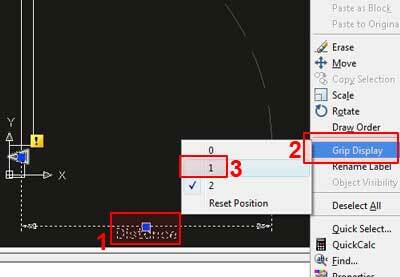 Move your mouse to 'Grip Display' (2 - Fig.7) on the menu, then Left Click on the number 1 (3 - Fig.7). You should now notice that there is only 1 grip on the linear parameter. If we had kept 2 Arrow Grips, the door would have been able to be modified in 2 directions. Before we add an action, we will alter one last thing on the linear parameter. 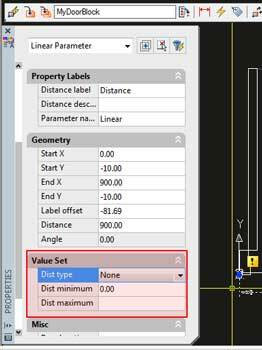 Again,select the linear parameter by clicking the word 'Distance'. Right click to bring up a menu, then Left Click on properties. Left Click the Drop Down Box next to the menu item called Dist Type. There are 3 items on the menu: None, Increment & List. For this tutorial, select Increment. 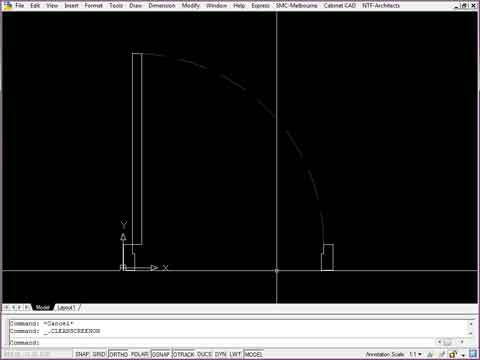 Increment means that when we drag the Arrow Grip, the door will only be sized by a certain amount between a range. Dist Maximum is the maximum distance Arrow Grip 2 will end when measured from Arrow Grip 2. Based on these values, if we started at 620mm, the next value would be 670mm, then 720mm etc. The alternative option in the Drop Down Box called "list", allows the user to specify actual lengths. So we could list 620mm, 670mm, then skip to another measurement like 800mm. The grip in this case will only snap to entered values. Next Left Click the Move Action (2 - Fig.10). You will be prompted to select a parameter. Left click the word 'Distance'. 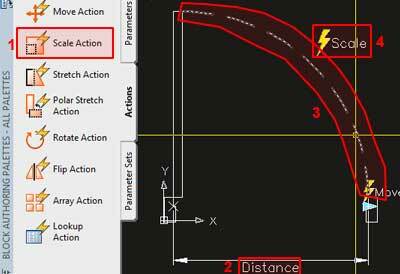 After selecting the parameter, you wil be prompted to select the Arrow Grip to associate with the Move Action. Move your mouse over Arrow Grip 2 so a red circle appears near the Grip (3 - Fig.10), then click on/or near the Arrow Grip. You will be asked to select objects to move. Select the Door Jamb where Arrow Grip 2 is located. (Fig.11) Once selected, hit enter to confirm selection. To see how the Door block works, Click on Close Block Editor, click Yes to Save Changes, then Select and move the Arrow Grip. The Door jamb will move but the door leaf and swing do nothing. Let's fix this. 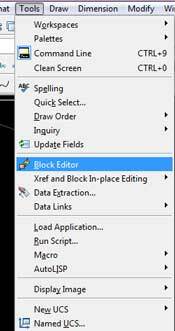 Open the block editor again. Alright, back in the Block Editor we are going to Stretch the Door Leaf based on the Arrow Grip position. Next we are asked to"Specify the First Corner of the Stretch Frame". Draw a rectangle as shown in (4 - Fig.13). This frame means any objects located inside of this frame and that are added to this action will be be stretched. After creating the rectangle, Select the door leaf then press enter. Locate the Stretch command just above the Door. Now this might seem all good and well but if you were to try out the door at this time it wouldn't behave correctly. The reason this is, is because the Stretch command by default will try and strectch Left & Right, not Up and Down. Again, Close the Block Editor, click Yes to Save changes and try out your door. The door jamb and door leaf should now move together when the Arrow Grip is moved. Great as this is, the door swing doesn't do anything still. Open up the Block Editor again so we can fix this. Similar to the previous 2 Actions, we go to the Actions tab on the Tool Pallete, but now we select Scale as our Action. After selecting Scale Action (1-Fig.15), select the word 'Distance' (2 - Fig.15) Then Select the Door Swing (3 - Fig.15) and position the Scale Action just above the Door Swing (4 - Fig.15). Close the Block Editor, Click Yes to Save changes and you now have a functioning dynamic door. One last thing, you may have noticed that the Arrow Grip isn't positioned in a very good place for stretching the door. It would be much better if the Arrow Grip was at the end of the Frame. 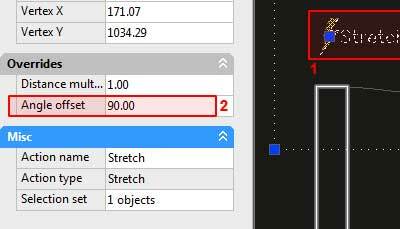 Well, open the Block Editor once again and select the Arrow Grip (1 - Fig.16). This is the original position of the Arrow Grip that we want to move. Once the Grip is highlighted, select the blue squared grip centered on the Arrow Grip, and then drag it down to the new position (2 - Fig.16). Now the grip is placed in a much better position - try it out. 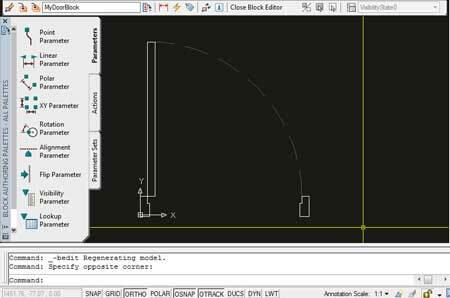 Hopefully this gave you a beginning insight into creating a dynamic door. 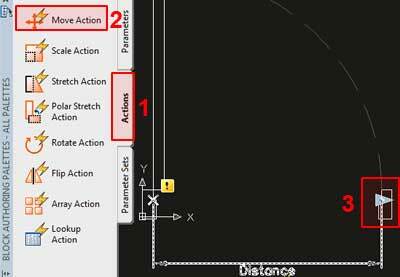 Next tutorial I will show you how to add additonal Actions to the door to make it flip directions by clicking on special grips.